Launched just two years after the contract was awarded, on schedule and on budget, the first Pacific Patrol Boat Replacement (PPB-R) unit, one of a number due to be delivered to regional navies by Australia, is scheduled for delivery to Papua New Guinea in late October 2018. 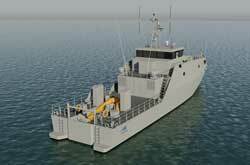 “Austal is proud to be delivering the PPB-R programme for the Commonwealth. This is the first steel ship programme we have managed, and we are doing so on time and on budget” Austal CEO, David Singleton said. The programme will support 200 direct jobs at Austal and a further 200 indirect jobs in the broader Australian industry. Construction of the patrol bats will be completed in late 2023, and Austal is also working on export opportunities based on the Pacific Patrol Boats. The Pacific Patrol Boat contract was awarded to Austal in May 2016 and is worth A$305 million (US$226.8 million) for the original 19 vessels and associated in service support, a further contract having been awarded in April 2018 for two additional vessels for A$29.7 million. The latter pair of vessels will be gifted to Timor-Leste following an agreement between Australian Prime Minister Turnbull and Prime Minister Alkatiri of Timor-Leste in November 2017. The Guardian class patrol boats are being built for a total of 13 nations using Austal’s proven patrol boat design platform. The vessels are 39.5m long with a beam of 8m and a loaded draught of 2.5m. The patrol boats are capable of at 20knots and at 12knots possess a 3,000nm range. Each vessel can accommodate 23 people. Intended as rugged and reliable vessels that are easy to operate and maintain, the PPB-R uses a saltwater WC flush system. This reduces freshwater usage enabling reduced FW tank size and water-maker capacity and reduces through-life costs. The GW/BW discharge pumps are identical, reducing sparing and providing interchangeability of parts. The sullage system allows grey water discharge overboard with STP treatment of blackwater. Austal proposed similar equipment for the PPB-R to that already in installed in the Pacific Patrol Boats (PPBs), which the new patrol boats will replace. The Austal PPB-R uses a common make of main engine and generators and a reduced number of tanks to simplify the fuel system arrangement. Improved fuel consumption will be ensured by use of electronic control of the main engines. The Austal PPB-R uses fuel coalescers rather than a centrifuge to reduce the maintenance burden and atmospheric crankcase breathers are utilised, eliminating through-life costs associated with ingestive crankcase breathers. The design also has improved access to all voids and bilge spaces for inspection and maintenance and simplified monitoring and control mechanical systems. Commercial off-the-shelf navigation and comms equipment is specified for easy operation and maintenance.